I recently had a discussion with my wife regarding the founding of the United States. We came to the conclusion that, although many Americans like to think the country was founded upon the principles of freedom, it was actually commerce and enslavement that were the driving forces that led to the founding of America. With that still fresh in my mind, I came upon an interesting passage while reading this installment of Gaiman’s “American Gods” series. The important thing to remember about American history is that it is fictional. It is a fine fiction that America was founded by pilgrims seeking the freedom to believe as they wished. In truth, the American colonies were as much as dumping ground as an escape. In the days when you could be hanged in London for the theft of twelve pennies, the Americas became a symbol of clemency, of a second chance. Transportation, it was called: for five years, for ten years, for life. You were sold to a captain and shipped to the colonies to be sold into indentured servitude–but at least you were free to make the most of your new world. Another part of this comic really interested me was the three sisters. Gaiman based his three characters on the Slavic myth of the two sisters who watched the stars for a sign that the universe was about to end. In Slavic mythology, the Zorja (alternately, Zora, Zarja, Zory, Zore = “dawn”; Zorza in Polish, Zara-Zaranica (Belarusian: Зара-Зараніца), Zvezda, Zwezda, Danica = “star”) are the two guardian goddesses, known as the Auroras. They guard and watch over the winged doomsday hound, Simargl, who is chained to the star Polaris in the constellation Ursa Minor, the “little bear”. If the chain ever breaks, the hound will devour the constellation and the universe will end. The Zorja represent the Morning Star and the Evening Star. The Zorja serve the sun god Dažbog, who in some myths is described as their father. Zorja Utrennjaja, the Morning Star, opens the gates to his palace every morning for the sun-chariot’s departure. At dusk, Zorja Vechernjaja—the Evening Star—closes the palace gates once more after his return. In Gaiman’s retelling of the myth, he adds a third sister. It seems that Gaiman did this to also tie in the mythologies of the triple goddess, the three fates (Moirai), and possibly the three witches from Macbeth. You wanted to know what I was looking at. The Big Dipper. Odin’s Wain, they call it. The Great Bear. Where we come from, we believe that it is a thing, not a god, but a bad thing, chained up in those stars. If it escapes, it will eat the whole of everything. And there are three sisters who must watch the sky, all the day, all the night. If he escapes, the thing in the stars, the world is over. So far, I really love this series. Even though the artwork is a little weak, the quality of the writing makes up for it, and then some. I think I will have to reread the original text of American Gods at some point when this graphic series is finished. Since today is the Fourth of July—Independence Day—I figured I would write a post about the Pledge of Allegiance. The Pledge of Allegiance was written in 1892 by a socialist minister named Francis Bellamy. It is important to note that the original was quite different than what is recited today and historically underwent two critical changes. Finally, in 1954, the phrase “under God” was added, particularly in response to fears over Communist threats. I found it interesting that the Pledge of Allegiance in its current state is essentially a 20th century construct. It makes sense, though. This was a period that saw the rise of nationalism throughout the world, as well as McCarthyism in the US, requiring citizens to demonstrate their loyalty to country. But I think what is most fascinating is that it was a socialist who composed the original words, and that as a minister Bellamy did not include any reference to God. The fact that the mention of God is a fairly recent addition says a lot. Also, it should be noted that Francis Bellamy’s daughter opposed the mention of God in the Pledge of Allegiance. Anyway, here is the link to the source material I read. Reading this never gets old for me, regardless of how many times I have read it. It is a masterpiece and is as pertinent today as it was when it was written over 200 years ago. Although we have come a long way as a society, we still struggle and groups are still discriminated against. Injustices still occur which are justified by religious dogma or corporate despotism. And while it’s easy to point out the things that are wrong in our country, I can’t help feeling optimistic when I read this document. As long as we maintain a view of the ideal, we can move forward as a society. Rather than spend a lot of time reflecting on the text, I figured I would just include it here in its entirety for you to read and hopefully get inspired. I copied the text from the US Government Archive’s website. Have a happy and safe Independence Day! Last year for my Independence Day blog post I read and commented on the Declaration of Independence. 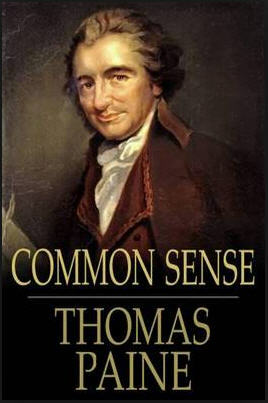 This year I opted for Common Sense by Thomas Paine. I’d read it years ago in college in my “Survey of American Literature” class, so I understood the concepts that Paine was trying to convey, essentially making a “common sense” argument in support of independence for the colonies. Overall, I found this to be pretty dull reading. Paine is slow in getting to the point and as far as his simple facts go, he sure uses a lot of words to state them. That said, I approached the text with the intent of seeing what, if anything, is still relevant today. I found a couple of passages that could be applied to current issues. The first issue I would like to address is marriage equality. In the US, we have a history of failing to acknowledge that discrimination based upon sexual preference is morally wrong. Many people are still attempting to pass legislation narrowly dictating what types of marriages should be accepted in this country. Essentially, this behavior is what Paine asserts is the defense of custom. I see the tumult finally subsiding, as demonstrated by the recent Supreme Court decision striking down the Defense of Marriage Act. The antiquated ideas that have been promoted as custom and tradition are finally being swept aside. The next issue is that of commerce. Paine states that when commerce, or capitalism, becomes the main focus of a country, that country suffers. People become complacent and are not willing to take the risks necessary to advance society as a whole. Paine concludes his pamphlet by addressing the issue that has plagued us from the beginning: the separation of church and state. Today, there are still people who use religion as a reason for promoting laws, especially laws that deny or restrict the rights of others. We must always remember the words of those who founded this country and oppose the influence or religion on politics whenever it rears its head. Have a happy and safe Fourth of July, and help keep freedom and equality safe in this country. 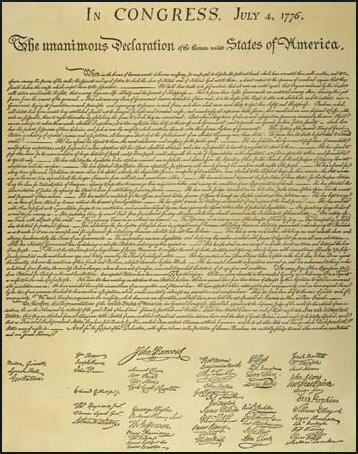 It has become customary for me to read the Declaration of Independence every July 4th. I think it’s important to keep fresh the principles on which this country was founded, especially when it seems that these principles are being distorted, neglected, and flat out broken. 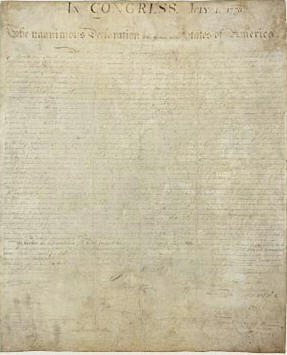 I recall several years ago, visiting the National Archives in Washington DC on a July 4th weekend, and thinking how our government was founded on a piece of paper, as opposed to the crown jewels that represent British government. It did make me feel proud to be an American. I’d like to start by mentioning one of the more recognizable passages from the text: “We hold these truths to be self-evident, that all men are created equal, that they are endowed by their Creator with certain unalienable Rights, that among these are Life, Liberty and the pursuit of Happiness.” I’ve thought about this passage a lot this past year, as I’ve seen the rights of American’s being stripped away because of their sexual orientation. The pursuit of happiness means that individuals should have the right to be with a person who makes them happy and to share the same rights as all other citizens. The document continues to list the offenses of the king against the colonies. As I read through the list, there were several that stood out as applicable today. He has refused his Assent to Laws, the most wholesome and necessary for the public good. — I see this occurring on a daily basis in Congress. Votes are cast along party lines without regard to whether a law benefits the citizens. Even worse is when laws are passed that benefit corporate interests at the expense of individuals and communities. He has called together legislative bodies at places unusual, uncomfortable, and distant from the depository of their public Records, for the sole purpose of fatiguing them into compliance with his measures. — This occurred just the other day here in NC, when the state legislature dragged out a session, causing a House representative to accidentally hit the wrong button on a vote to overturn a fracking ban. She immediately announced her mistake, but the people seeking to overturn the veto refused to allow her to change her vote and viewed it as a victory. He has endeavoured to prevent the population of these States; for that purpose obstructing the Laws for Naturalization of Foreigners; refusing to pass others to encourage their migrations hither, and raising the conditions of new Appropriations of Lands. — I have just one word to say about this: Arizona. He has made Judges dependent on his Will alone, for the tenure of their offices, and the amount and payment of their salaries. — All I could think about as I read this one was Clarence Thomas. Let’s face it, he is not the picture of unbiased interpretation of the Constitution. And yes, Supreme Court justices tend to be either conservative or liberal, and I believe maintaining a balance is good, I have yet to see Mr Thomas vote in any way that would make me think that he is not a puppet. He has plundered our seas, ravaged our Coasts, burnt our towns, and destroyed the lives of our people. — As I think about the environmental destruction of our resources and coastal regions for the sole purpose of monetary gain and to quench our insatiable thirst for cheap energy, and how people are now suffering as a result of assaults on the environment, I feel quite certain that our founding fathers would be appalled at what we have allowed to happen. I encourage everyone to let go of the petty team mentality that has caused such a rift amongst Americans, resulting in intolerance and animosity that is based solely upon whether a person is considered progressive or conservative. Get involved, read, make educated decisions, and do not allow yourself to be swayed by propaganda. You can take the first step by carefully reading the Declaration of Independence right now. Click here to read the text from the Archives’ website.